. :: FEI BUREAU ALLOCATES FEI WORLD EQUESTRIAN GAMES™ 2018 TO CANADA ::. The FEI Bureau unanimously approved Bromont/Montreal as host city for the FEI’s flagship event, the FEI World Equestrian Games™, in 2018. The decision came after the FEI Evaluation Commission’s report was presented at the start of the Bureau’s two-day meeting at FEI Headquarters in Lausanne (SUI) today. The Bromont Olympic Equestrian Park, venue for the Montreal 1976 Olympic equestrian events, will be the hub for the FEI World Equestrian Games™ in 2018. Bromont/Montreal is only the second host outside Europe following the Alltech FEI World Equestrian Games™ in 2010 which were staged in Lexington, Kentucky (USA). Lexington was the other remaining bidder for the 2018 Games. The Bureau felt that both bids were impressive but that Bromont/Montreal was the stronger of the two. “We are really delighted to award the 2018 Games to Bromont/Montreal,” FEI President HRH Princess Haya said after the Bureau decision. “The Bromont Olympic Equestrian Park is an exceptional and proven venue, and will be the ideal location for the eighth edition of the FEI World Equestrian Games, our most global equestrian event. “We are now just 75 days from the opening ceremony of the 2014 Games in the heart of Normandy, when over 500,000 spectators and millions of TV viewers will watch the best equine and human athletes compete for world titles over two weeks of absolutely top equestrian sport. The FEI had reopened the bidding process for the FEI World Equestrian Games™ 2018 in July of last year when the Canadian bid team for Bromont/Montreal was unable to provide the full public sector financial support that was required before an allocation could be made. Confirmation that the Canadian bid committee had subsequently secured substantial government backing was a crucial element in today’s decision. 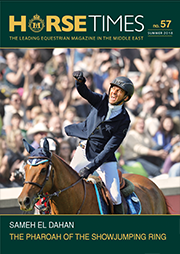 The FEI World Equestrian Games™ are held every four years, in the middle of the Olympic cycle. The seven FEI disciplines - Jumping, Dressage and Para-Equestrian Dressage, Eventing, Driving, Endurance, Vaulting and Reining - are all included on the competition schedule. The inaugural FEI World Equestrian Games™ were hosted in Stockholm (SWE) in 1990. Since then the Games have been staged in The Hague (NED) in 1994, Rome (ITA) in 1998, Jerez (ESP) in 2002, and Aachen (GER) in 2006. The first Games to be organised outside Europe were the Alltech FEI World Equestrian Games™ in Kentucky (USA) 2010. The seventh edition of the FEI’s flagship event will be held in France this year, with the Alltech FEI World Equestrian Games™ 2014 in Normandy running from 23 August – 7 September. See www.normandy2014.com.